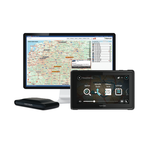 TomTom Telematics, with its main location in the Netherlands, is the biggest Fleet Management Provider in Europe. Our Telematic Solutions are being used in 400.000 vehicles - ranging from simple GPS-Track-and-Trace or electronic Logbook for the Fiscal Authorities, Job-Order-Management and Messaging via connected Navigation Systems, to Remote Download and Archiving of Digital Tachograph Data. With around 200 Software-application partners, our solution spectrum is being greatly expanded, Bluetooth-connectivity is offering additional possibilities for connecting 3rd party Hardware. We are offering Telematic Solutions for connected vehicles. Our Webfleet Plattform is most easy to use and our solutions are installed in 400.000 vehicles. We are the only ISO27001 certified (Data Protection) supplier in this field.